We're so thrilled to bring Caves of Qud to itch.io in early access. 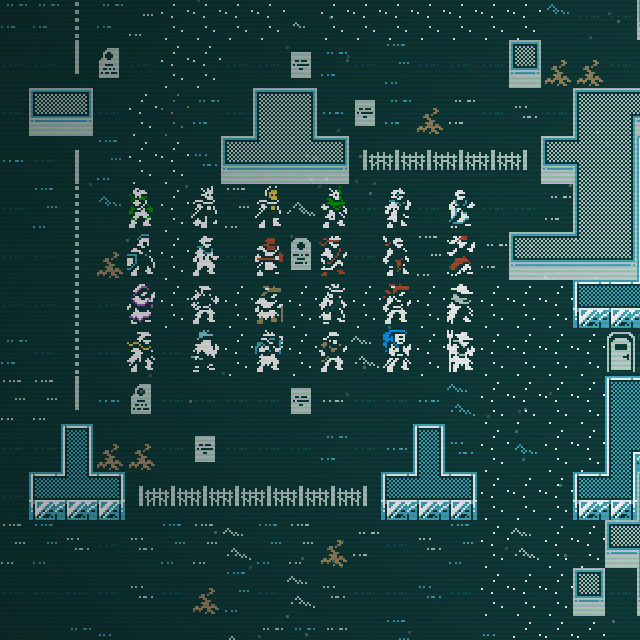 A decade in the making, Caves of Qud is a science fantasy RPG & roguelike epic. It’s set in a far future that’s deeply simulated, richly cultured, and rife with sentient plants. Come inhabit an exotic world with us and chisel through a layer cake of thousand-year-old civilizations. We're pairing this launch with an enormous update that includes procedurally-generated villages with their own NPCs, factions, histories, architectural styles, relationships with local resources, storytelling traditions, proverbs, signature dishes, signature skills, and quests. You can now choose to start the game in one of these villages rather than the original handcrafted starting village. It's hard to overstate how big this patch is. We've been adding features to the game for the last several years— in both small, weekly patches and bigger feature arcs—and this is by far the largest update yet. You can follow our path out of early access on our website's roadmap. Finally, we hope you'll come chat with us on our new, growing Discord server. The Caves of Qud community is the best there is: weird, warm, and welcoming! Where there is sun, there is salt. Where there is salt, there is chrome. Live and drink, friends. The caves of Qud await you.